Posted July 26, 2017 by Alec Smart & filed under City News. Loiter behind a city restaurant after sunset and chances are you’ll encounter some of our oldest, and often most feared, companions rummaging for food scraps. Usually reticent and inclined to nocturnal wanderings, lately they’re becoming bolder, frequently seen scrounging in broad daylight. An increase in rat activity across Sydney’s city and inner suburbs has coincided with an unseasonably warm winter. This follows a summer with some of the highest temperatures since record keeping began in 1858. However, opinions are divided on whether the warmth has contributed to a surge in rat numbers, or merely encouraged the existing rodents to be more mobile. 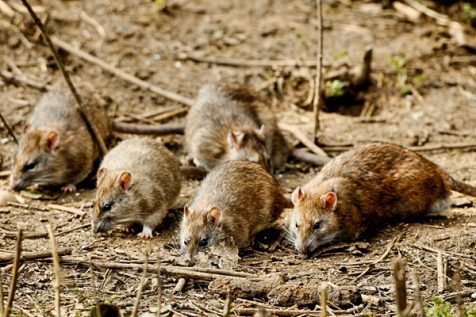 There is plenty of anecdotal evidence from across the CBD and inner city suburbs that rats – the brown imported variety commonly known as the sewer or wharf rat – are swarming through public parks, congregating around restaurants, entering homes, and generally being a nuisance. Brown rats are prolific breeders and females can produce up to five litters a year with a maximum of 14 babies in each. Females reach sexual maturity at five weeks of age, so an initial breeding pair whose descendants are predominantly female can potentially produce 15,000 offspring in a year. Originally thought to be the source of the bubonic plague, which killed an estimated 50 million people across Europe, Asia and Africa in the 14th Century (later found to be fleas on black rats), the brown rat is, nevertheless, a transmitter of noxious, often fatal diseases, including Viral Hemorrhagic Fever, Toxoplasmosis, Hantavirus and Weil’s disease. In a recent City of Sydney Council meeting, Councillor Christine Forster sought an improvement to the City’s capacity to deal with what she declared was a worsening problem of rat infestations across the CBD. “It is clear from both my own observations and from feedback I’ve had from the community that rats are increasingly a problem in the City,” she said this week. Brown rats live in social groups and dig extensive borrows, although they will rarely stray beyond 20 metres of their nest if regular food sources are available, and they eat almost anything. Within areas densely populated by people they can guarantee a virtually limitless cuisine. Brown rats are most comfortable in damp environments, such as sewers, basements and old buildings, but major construction works, including the upgrade of the Anzac War Memorial, the cross-city light rail project, numerous renovations and new high-rise developments might have disturbed old nests, provoking them to seek new territory. Peter, who lives behind a row of restaurants on Oxford Street, Darlinghurst, often sees rats congregating around neighborhood refuse bins. “My dog caught three in my front garden a month back. The council placed baits in the street, so apparently there are a lot less around, but I still see them,” he said. The City of Sydney Council uses a variety of measures to keep rats in check. “Pest management is the responsibility of the pest control officer and 25 environmental health officers,” a spokesperson said. Councillor Christine Forster believes the City Council’s measures fall short. However, Expert Pest Control, a pest eradication company that operates Sydney-wide, doubt that rats are on the increase. Yet the rat problem isn’t limited to the inner city. In suburbs surrounding the business district, reports continue that there are significant increases in rat activity throughout areas both affluent and industrial. “I found a huge one in my back room in Leichardt two days ago,” said Katy. “I know of a cafe that found rats in their kitchen through health inspectors’ visits,” Maka of Dulwich Hill revealed. Expert Pest Control disagree that rats are increasing outside the CBD. The City of Sydney also disputes that rats are increasing elsewhere. “Staff will continue to monitor the reported complaints and if there is an increase in complaints over the next 12 months we will again review the strategies to manage and control pest activity in the LGA,” the spokesperson said. *Report rodent concerns to the City’s customer service team on council@cityofsydney.nsw.gov.au or (02) 9265 9333.